Huge feature by Chris Gebhardt! Wonderful article Chris G. What a fantastic little machine that continues to amaze... The teams should proud of their accomplishment! Great article! It's hard to keep up with, and to filter for, the most important news on the lander missions. Still, NASA's, JPL's, and the university run sites have lots of content, and are of high quality. I'm not an engineer, but the shorthand references by posters in some threads, to Mars' atmosphere as a vacuum, seem slightly exaggerated! Seems like the mean path length between molecule collisions is closer to the Earth's rather than interplanetary space (see below image from NSF article). Superb article, many thanks Chris G! Excellent overview and summary of the 2 operational Mars rovers and the current mission status. It is incredibly difficult for someone like me - an enthusiast, surely, but not involved in the scientific or engineering communities - to keep up with all the various missions out there. It can also be a challenge for me to truly understand the significance of certain discoveries and temper what is surely overblown mainstream news coverage. Articles like this are the reason I subscribe to L2 on this site. The content here is just incredible, and presented in such a way that a neophyte such as myself can follow it easily. Not to mention that I do not have to deal with the sensationalism that is so rampant in other news sources. Thank you for all the amazing work you do here at NSF, and keep it coming. very thorough, nice. I'm really liking these year in review detailed posts ! I think they need to send people to confirm whether there is life there. I think that can probably confirm that without the intervention of humans directly. This is one of the most complete and science-based article about the Martian Rovers I ever read. Congratulations Chris G. Really enjoyed reading it. This statement is just a little bit stretched. This is the kernel of the problem, not an answer. We just don't know which is the probability for life to develop and all this emphasis on "organics molecules" (found rather everywhere in the cosmos) should not bias actual knowledge that we just don't know. We really don't know what trigger the development of life. Our knowledge on this matter is nearing zero. Last point, rather than thinking what we could do on Mars with a manned expedition, I wonder just the opposite: what we could do on Mars (and somewhere else) with more money and more frequent and evolved Mars Rovers up there rather than in dubious and scientifically marginal (for the bucks) outposts in LEO orbit. p.s. Please remember this is an opinion based on actual arguments. It's unpopular and can certainly be negated, but I still have the right to tell and discuss it based on actual arguments. Well it's not as if Mars is going to be short of upcoming rovers. I can think of least four up until the end of the decade; ExoMars, Curiosity MK 2 and rovers from India & China. It's not a problem of quantity (is 4 small or large? Is 6 astronauts on board small or large? Who knows? ) but of budget and sophistication. ADDED: despite that, funding for extended missions since 2015 is not yet guaranteed AFAIK... ridiculous! And even if it will, it's unbelievable this has not been given the highest-level priority. I have to disagree. The article is very astute. We now know from the emerging field of replicator thermodynamics that the energy cost of replication (so not to dissociate as fast as it replicates) and exponential growth (so evolution emerges) necessitates NET out of the requirement of irreversibility. That in turn means you need a metabolic engine (electron bifurcating metal atoms) as a "trigger"*, and a CO2 carbon source and an NO2 electron sink out of volcanism works that engine. And we can test this! Life emerged so fast on Earth that, as a simplest possible stochastic process model, you can use the sole observable data point to say that life emerges with fast repeated and/or much successful attempts to scale Mount Improbable. (This is the one case were statistics are lenient, just one data point is enough to push a process average back within control; here used for testing.) A paper did the test 2010, IIRC. YMMV, certainly not many people sat up and took notice. Another way to say this is that physics is continuous. This is why we can live in free fall environments of space without having evolved for that environment, the environment we have evolved for is similar enough. And that is loosely how I interpret the article question here, in the same conditions expect the same results by continuity. *Seeing how the process is broken down in small steps, I don't think of this constraint as much as a "trigger" as a contingent happenstance. The process is more akin to how a mountain chain grows when plates collide, and the NET results are used by exactly those who research geological systems as ancestors to life. "Detecting extraterrestrial life using mechanical nanosensors"
Interesting comment, thanks, although I am not necessarily convinced. The fact that life emerged very early is a good indicator, but statistically speaking doesn't say very much. Can you please write some references regarding what you says? I imagine what you are referring to but, not being my field, I may be missing something and would like to read the original papers. I remember a paper some years ago (cannot find it anymore but I discussed about it very much) talking about the fact that DNA/RNA could be the only chemical mechanism available to guarantee certain characteristics of life. This is important because it means we could at least "recognize" alien life and apply standard tests to verify its existence. In general, however, I think that this emphasis on life is scientifically not really sound. I'll try to explain why. Essentially, the feeling is that in the last 3-4 decades we are accumulating a lot of "evidences" about life, as there is a continuous number of outreach articles "ehi, look at this! This means we are closer to finding alien LIFE!!!". But when you look at what they say is just something we already know since long time. Like counting more and more times the same evidence. The fact that organic molecules can be found almost everywhere, for example (on 67P, in the interstellar matter, or quite abundant "sugar" in a planet formation region), is no more a surprise and should be seen like that. Also the methan amount variation found recently look like like this: we found something new. But this too was well known since many years and we have just confirmed it with no further increase of the probability for this to be related to some organic process. Interesting, but not tending - as media put it - any closer to finding life around. Note I'm not criticising the article. I do not because, as I say, there is some room for interpretation in this field and the rest is so wonderful and well written I can't really do that. As I said, "I" consider that statement a bit stretched as I think the question is misleading and when I talk to the general public I find quite often that a lot of people miss the importance of this simple statement today: finding conditions for life, doesn't necessarily mean we will find life as the probability for life to develop is essentially unknown, even when you add the information you added. As Dirac put it once, if this probability is - for example - 10^-100/billion year/average planet, we will never find life (probably, unless there are some "transport" from one planet to another, that can be the case of Mars...). And there is no reason to say it is 10^-100 or 10^-10. As simple like that. It would be very difficult. Even with unmanned MSR. Nobody has said it is the answer. But it is certainly a question to be answered. Whether in the affirmative or negative, the results are important. Do you realise how limited the science done by Curiosity actually is? For example for mineralogy we have had only four analyses published to date, in over two years. Two of sand, two of rock, of sites sampled two years ago. More evolved rovers are certainly something to look forward to, but they will still be very limited in every respect, limited in power, volume, mass, science capabilities, mobility, and bandwidth. These are intrinsic limits. As for comparing this to work done on the IS, it's apples and oranges. The ISS does very different kinds of science. Also important, also interesting. You might as well compare the work of Curiosity with that of Hubble. In the literature you will see that four astronauts are a smallish crew (smaller have been discussed), six is typical and more than six is large. Since when has Curiosity cost 7 billion? As for return, what Curiosity has achieved to date is equivalent to one EVA by a pair of astronauts with an unpressurised rover. There is no question that a crewed mission would return orders of magnitude more data than the same amount spent on unmanned missions (in the unlikely event of that actually happening. What is up for debate is whether societies want to know that much about Mars. Up to know they haven't, so we make to with unmanned spacecraft and their limits. Which is fine up to a point. But sooner or later it will be time to move to the next level. 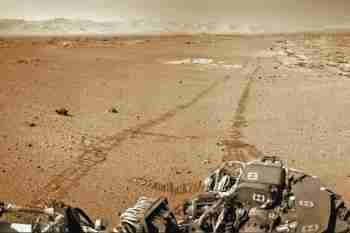 Funding for Curiosity has been approved through to 2016. Whether they achieve the goals set for this period remains to be seen. Despite the hype Curiosity fell well short of what was predicted before landing. There certainly has been a lot of hype. But the reality is it has taken 38 years since Viking to actually detect organic matter on Mars (claims of detection, generally disputed, have been made for Martian meteorites, telescopic and satellite observations). We still don't know whether the martian organics are biogenic, Curiosity has the potential for doing so, but has not so far done it. The latest organic results mentioned still are not published, and they will be subjected to ruthless criticism. I find quite often that a lot of people miss the importance of this simple statement today: finding conditions for life, doesn't necessarily mean we will find life as the probability for life to develop is essentially unknown, even when you add the information you added. As Dirac put it once, if this probability is - for example - 10^-100/billion year/average planet, we will never find life (probably, unless there are some "transport" from one planet to another, that can be the case of Mars...). And there is no reason to say it is 10^-100 or 10^-10. As simple like that. This is quite true. Habitable does not equal inhabited. Mars appears habitable in the past, it is at best marginally habitable now, whether it is or ever was is something to be investigated. How that organics have been confirmed instruments can be tailored to study those molecules. It's probably too late for ExoMars, we will have to make do with what's been selected (which will still be very exciting). But the proposed Indian and Chinese rovers and NASA Ames icebreaker mission will hopefully be able to incorporate the latest results. I'm wondering : if you have a human operating the same data acquisition tools that Curiosity was given ( because of obvious payload limitations ) and relaying back data at the same rate, how would you expect to get more science done ? Because that is all that Curiosity does, it acquires data and sends it back to earth where the actual "science" gets done. If you designed it for more bandwidth/power/payload with more in-situ instruments available etc then it would be sending back a lot more, of course. EDIT: i dont mean this as a humans vs robots argument actually. I think it is obvious that that if you allocate mass budgets on the scale that is required for human missions, you will get proportionally larger returns too. Apollo went to the moon with 50 tons TLI, if you ever decide to send so much equipment to Mars, prepare to be amazed. Manned or unmanned.